"I received the Traditional Edition - very nice oak container, and I appreciated your sympathy note enclosed. 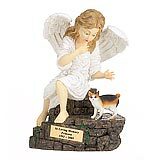 My Maggies ashes are tucked inside and she sits on my dresser where she gets a loving touch each day. I am very satisfied with your professional and fast service. " 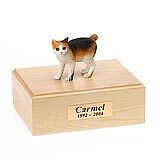 All available Japanese Bobtail cat urns and memorials will be displayed with the figurine on the Japanese Bobtail urn you select and in the appropriate size.